- Boston Manor Park - one of the most notable public parks of the area is Boston Manor Park. 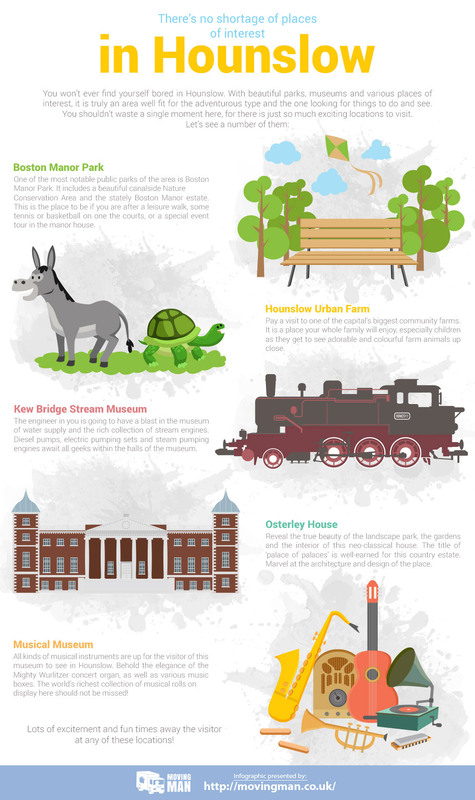 It includes a beautiful canalside Nature Conservation Area and the stately Boston Manor estate. This is the place to be if you are after a leisure walk, some tennis or basketball on one the courts, or a special event tour in the manor house. - Hounslow Urban Farm - pay a visit to one of the capital’s biggest community farms. It is a place your whole family will enjoy, especially children as they get to see adorable and colourful farm animals up close. - Kew Bridge Stream Museum - the engineer in you is going to have a blast in the museum of water supply and the rich collection of stream engines. Diesel pumps, electric pumping sets and steam pumping engines await all geeks within the halls of the museum. - Osterley House - reveal the true beauty of the landscape park, the gardens and the interior of this neo-classical house. The title of ‘palace of palaces’ is well-earned for this country estate. Marvel at the architecture and design of the place. - Musical Museum - all kinds of musical instruments are up for the visitor of this museum to see in Hounslow. Behold the elegance of the Mighty Wurlitzer concert organ, as well as various music boxes. The world’s richest collection of musical rolls on display here should not be missed! Lots of excitement and fun times away the visitor at any of these locations!